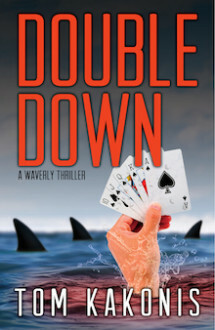 A mob boss has given professional gambler Timothy Waverly two weeks to make good on a $300,000 debt…or die at the hands of two hit men. Waverly’s only hope is convince a pill-popping, ex-girlfriend and her loser husband to set him up in a series of high-stakes poker games in Palm Beach with rich Arab prince who cheats at cards. But that’s not the only game that’s rigged. Waverly knows he’s going to be killed as soon as he pays his debt…and that somehow he’s got to cheat death in his biggest gamble yet. Choice...pull up a chair and name your game...Timothy Waverly, the ace gambler, is dealing this hand, so every card's a wild one...Tom Kakonis knows his game!